Gearbox's Randy Pitchford says that Duke Nukem Forever will wow people with its size and with its quality. Duke Nukem Forever is big. So big, in fact, that people will be astonished at its immense size. That's according to Gearbox boss Randy Pitchford, who called the single player campaign "huge" and said it weighed in at roughly three times the size of Activision's Call of Duty: Modern Warfare 2. Pitchford said that people would be surprised at just how long the campaign was, as from an outside point of view, Duke Nukem Forever went from "dead and buried" to "coming out next year" very quickly. 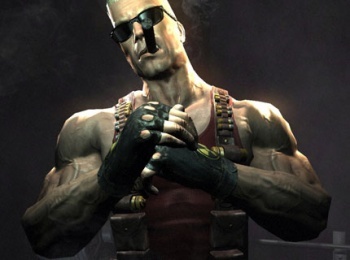 Unsurprisingly, he also claimed that the game was great from start to finish, and that while perfection was impossible, anyone who thought that Duke Nukem Forever was anything other than a "big triple A title," would be won over almost immediately. Obviously, as the ever-so-enthusiastic head of the studio making Duke Nukem Forever, anything that Pitchford says about it has a certain degree of spin to it, but reports from people who have had a chance to play it have been very positive. Duke Nukem Forever is scheduled for release early next year.